How Do You Reduce The Risk Of Gum Disease? The Centers for Disease Control studies show millions suffer from gum disease in the United States. Without treatment, the disease could lead to a greater risk of tooth loss. 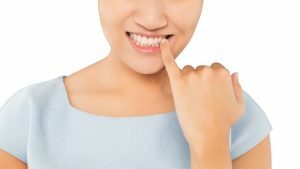 How do we reduce the risk of gum disease? What steps can be taken to help patients in Omaha, NE, enjoy better oral health? How Does Gum Disease Form? Periodontal disease develops when the gums undergo inflammation. Gum inflammation, also known as gingivitis, happens as a result of plaque buildup due to poor oral hygiene, smoking, certain illnesses and medications, and family history of gum troubles. Without treatment, inflammation eventually causes the gums to pull away from the teeth and form pockets. Once bacteria enter these pockets, the disease can form. Patients may then start to notice their gums feel sore, appear red, recede or swell, or bleed easily when brushing and flossing. If you begin to experience these issues, please see us right away for a diagnosis. We can reverse gingivitis, but gum disease is incurable and requires treatment to manage. Once gum disease forms, the disease grows worse without treatment to manage it. Eventually, periodontitis can form. The advanced stage of the disease actually attacks the connective tissue between the teeth and gums. Soon, teeth become loose or even lost, impacting the health and stability of your smile. Now that you know the warning signs and dangers, let’s talk about prevention. How do you avoid this disease? Well, start by brushing your teeth twice a day for two minutes, once when you wake up and again before going to bed. Even more vital, always floss your teeth before going to bed. Flossing and brushing remove food particles that bacteria could break down, limiting plaque buildup. You also need to see us every six months for a dental cleaning. The cleaning removes all plaque and tartar from the teeth, managing the disease and preventing worsening inflammation. If you have high risk factors for periodontal problems, we may suggest a visit every three to four months. We also recommend you avoid smoking or using tobacco products, as these not only harm your gums, but also increase the risk of cancer. If you have any questions about preventing periodontal problems, then contact our team today. At Pacific Hills Dental, we want to help you enjoy a smile free of periodontal disease. Talk to our team about general treatment options. To make an appointment for yourself or for a family member, call our Omaha, NE, dental office today at (402)330-2243. We proudly treat individuals in Omaha, NE, and all of the surrounding areas, including Papillion, Elkhorn, La Vista, and Millard.